Detecting the watermark from the rescanned image is still a challenging problem, especially for high resolution image. After printing and scanning, an image usually suffers global geometric distorts ( such as rotation, scaling, translation and cropping), local random nonlinear geometric distortions which is simulated in Random Bending function of Stirmark, as well as nonlinear pixel value distortions. The combination of both of the latter distortions is called nonlinear distortions. Many watermarking techniques, including the pilot-based watermarking techniques, are robust against the global geometric distortions but sensitive to the nonlinear distortions. Local random nonlinear geometric distortions remain a tough problem for image watermarking. In the setting of print-and-scan process, it becomes severer as combining with nonlinear pixel value distortions. This may defeat a watermarking scheme, especially for the print-scanning of high resolution image. 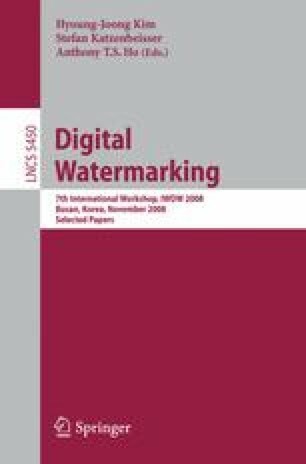 This paper proposes an effective pilot-based watermarking algorithm for the print-and-scan process. After careful analysis of the print-and-scan process, the pilot signal and the watermark are embedded and detected in the down-sampled low resolution image to deal with the combination of local random nonlinear geometric distortions and nonlinear pixel value distortions. Theoretical analysis and experimental results demonstrate the proposed algorithm is robust to the print-and-scan process and at low computational complexity. The major contribution of this paper is that we analyze the impact of nonlinear distortions in print-and-scan process and propose an effective watermarking scheme to conquer it. To our best knowledge, our work also first addresses the issues of print-and-scan resilient watermarking for high resolution images.